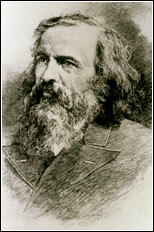 In 1869, just five years after John Newlands put forward his Law of Octaves, a Russian chemist called Dmitri Mendeleev published a periodic table. Mendeleev also arranged the elements known at the time in order of relative atomic mass, but he did some other things that made his table much more successful. Mendeleev realized that the physical and chemical properties of elements were related to their atomic mass in a 'periodic' way, and arranged them so that groups of elements with similar properties fell into vertical columns in his table. Gaps and predictions Sometimes this method of arranging elements meant there were gaps in his horizontal rows or 'periods'. But instead of seeing this as a problem, Mendeleev thought it simply meant that the elements which belonged in the gaps had not yet been discovered. He was also able to work out the atomic mass of the missing elements, and so predict their properties. And when they were discovered, Mendeleev turned out to be right. For example, he predicted the properties of an undiscovered element that should fit below aluminum in his table. When this element, called gallium, was discovered in 1875 its properties were found to be close to Mendeleev's predictions. Two other predicted elements were later discovered, lending further credit to Mendeleev's table. It is also worthy to note that Mendeleev's 1871 arrangement was related to the atomic ratios in which elements formed oxides, binary compounds with oxygen whereas today's periodic tables are arranged by increasing atomic numbers, that is, the number of protons a particular element contains. Although we can imply the formulas for oxides from today's periodic table, it is not explicitly stated as it was in Mendeleev's 1871 table. The oxides ratio column was not shown in earlier Mendeleev versions. Mendeleev rewrote each edition of Principles of Chemistry, including all new scientific data-particularly confirmations of the periodic law-and reanalyzing difficulties that had arisen to hinder its confirmation (inert gases, radioactivity, radioactive and rare-earth elements)"